Bang Bang Brussels Sprouts! Easy and spicy side to liven up your veggies. Adjust spice to your tastes and/or serve with skinny bang bang sauce. Gluten-free, vegan. I eat Brussels sprouts ALL. THE. TIME. But yet somehow this is the first time they’ve made it to the blog. 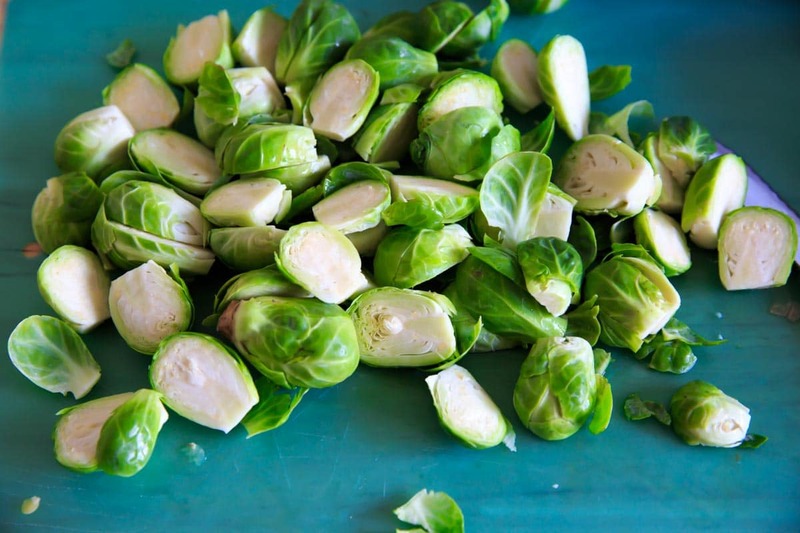 Most people have a weird hate for Brussels sprouts. I think those are the people who were served it boiled and flavorless and that was the vegetable that they were forced to eat at the kitchen table before they could be excused. But in my experience they can be SO flavorful! Roasting (or even grilling – don’t get me started) them with some simple sea salt makes for vegetables that people fight over. Or maybe I just hang out with people who really like vegetables? The trick is to make sure they are roasted long enough so that a fork goes in really easily. Otherwise you’ll be chewing more than necessary and we don’t want eating veggies to feel like work. My favorite is buying the sprouts when they are still on the stalk (<-which happens to be my very first Instagram picture) but they aren’t available year-round. Cut them in half (or quarters if they are really big). Then drizzle with olive oil, sweet chili sauce, sriracha, salt and pepper. Finish off with lemon juice for an extra tang. They are really easy to burn, so keep an eye on them! It helps to toss them on the baking sheet about halfway through so they are cook evenly. When I baked mine first, they didn’t have enough “bang” in them. So to make them bang BANG I added a pinch of cayenne and more sriracha on top. Do you like Brussels sprouts? What’s your favorite way to eat them? Bang Bang Brussels Sprouts! Easy and spicy side to liven up your veggies. Adjust spice to your tastes and/or serve with skinny bang bang sauce. Wash Brussels sprouts and cut in half (or quarters if sprouts are very large). In a small bowl, combine the olive oil, sweet chili sauce and sriracha sauce. In a large bowl (or ziploc bag), add the chopped Brussels sprouts and pour the sauce mixture in to combine until evenly coated. Spread out on baking sheet in an even layer and sprinkle with cayenne pepper (if using), salt and pepper. Roast for 25-30 minutes or until tender. Watch for burning! Sprinkle with lemon juice, and serve with extra sriracha sauce or a serving of bang bang sauce. Enjoy! Aah! 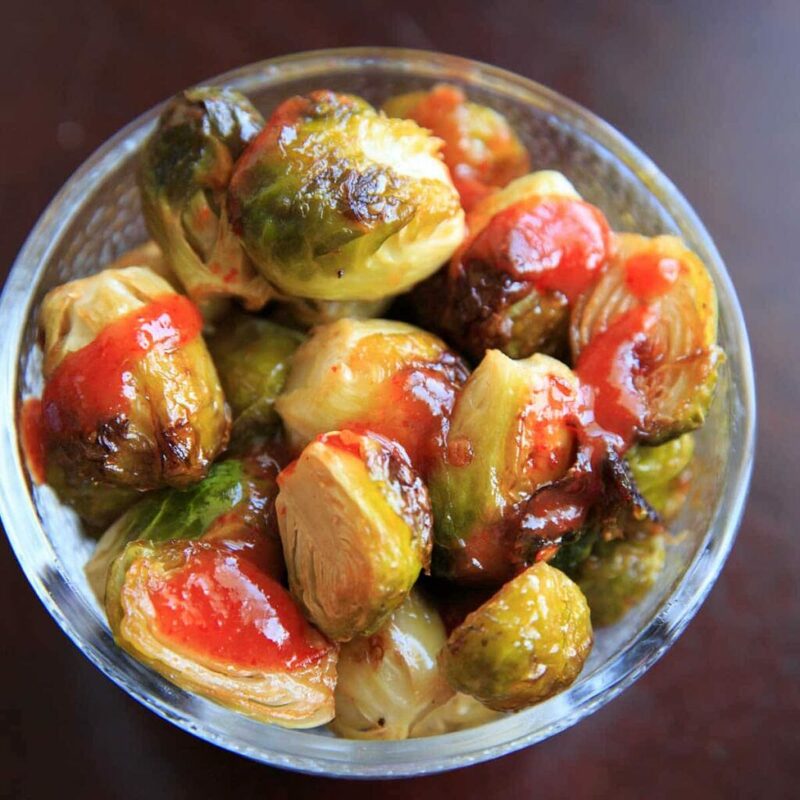 I love the idea of mixing sriracha sauce and brussels sprouts! 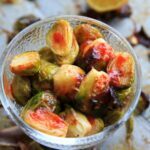 My itch to try brussels sprout is seems to be materializing looking at this easy recipe! Thank you. This is one of my favourite snacks. Roasting them makes them taste amazing! 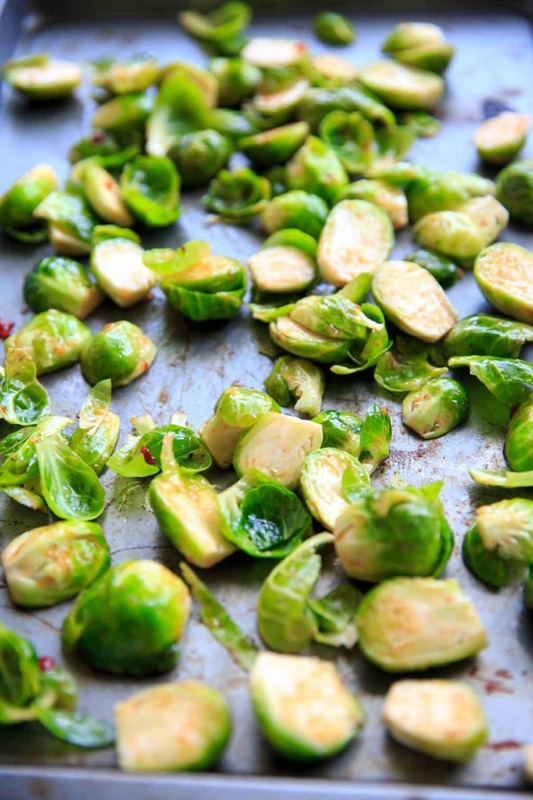 Brussel sprouts are great when cooked to perfection. I love the spicy hit these babies have – they would be delicious!! 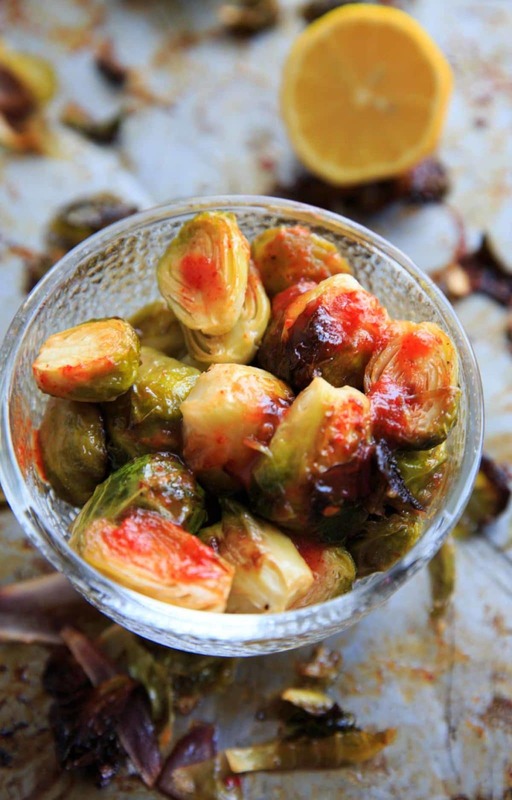 That sweet and spicy combination for Brussel sprouts sounds awesome. Love this recipe! So much flavor! These looked so good that I ran out and bought some brussel sprouts — making your recipe tomorrow! Kelli from YG! Yay, let me know how you like it Kelli! 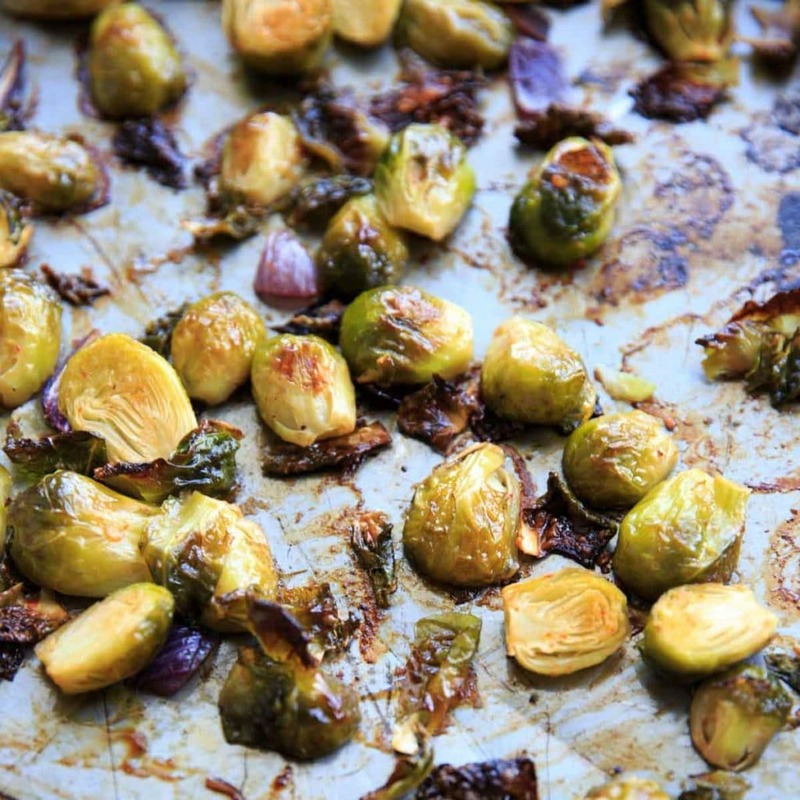 I love this recipe but every time I make it, the sprouts stick to the pan! Does that happen for anyone else? I’ve tried using foil, cooking spray, foil + cooking spray… nothing seems to do the trick. I still eat them of course 🙂 But a little annoying because I want to eat all of them! Hi, Alex – that definitely happens to me too with roasting any kind of vegetables! Parchment paper helps, but be aware that some aren’t recommended for temperatures above 400 degrees.